We’re professionals and our work shows it! Get In Touch NOW Friendly & Affordable Services! Most installations are completed in one day with no prep work on your part and no mess. One of our Professionals will come out and perform an assessment of the property and then sit with you to come up with a design that suites your taste. Once you’ve decided on the details of your project, we’ll set a date for installation. Give us a call! We’re standing by ready to assist you. Click below to dial. EdgeWise Curbing is a team of professionals that design and install custom decorative landscape curbing and decorative concrete overlay. Decorative concrete additions are innovative, affordable ways to immediately improve the appearance of any landscape. Installation by our fully insured professionals is quick and clean, requiring no preparation on your part. Highlight elements of your landscape. Define gardens, flower beds and property lines. Our extruded concrete borders provide a barrier between transitional edges on your property. For example, no longer will your weed whipper or lawn mower eat into your mulch or rocks. Create an effective root barrier keeping grass and weeds at bay. Retain mulch within the desired area. Reduce time spent trimming edges – the concrete is strong and stable enough to support the lawn mower wheel! Decorative Curbing is a very rewarding product and a great addition to your homes overall look. 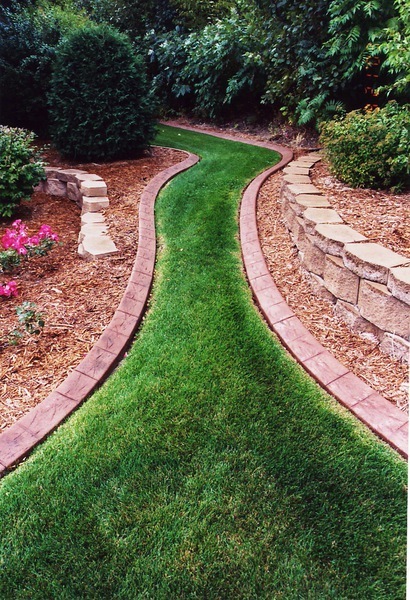 Landscape curbing adds value to your home, eliminates labor intensive yard work, and gives a clean, crisp, finished look to your freshly cut lawn. Landscaping is the first thing that potential buyers see, and it reflects well — or poorly — on other homes in the neighborhood. Good landscaping can add up to 28% to overall home value, says landscape economist John Harris. Will not rust like steel. Will not decompose and rot like wood. Will not move like brick. EdgeWise Curbing Inc., is a name you can Trust with Professional and Fully Trained Operators! In most cases, we can transform your property within 24 hours. Our customers love us and we love them. Checkout the social proof. We’re happy to give a free on-site consultation. You’ll love the results and you’ll feel great about your landscaping. Provide permanent and maintenance free edging and care. GET in touch today! Consultations are Free! They did a great job! My landscaping looks so great now! Thanks for your great work! These put a lot of care in their work. I would definitely recommend them! Love our Edgewise curbing! Looks great and added so much to the looks and practicality of our yard. No more do I have to fight temporary edging, it’s there, looks great, and doesn’t move. Thanks again Edgewise. We hired EdgeWise to put an addition on our patio and install a concrete slab for our garbage bins. We were very pleased with the end result. The owner even did a couple of magic tricks for our children and helped them put their handprints in the concrete! Great company! EdgeWise Curbing INC I would highly recommend! The work they did for us turned out beautifully! From the quoting, to consultation to the installation everything was seamless. Very easy to work with, courteous and you can tell they take great pride in their work. Reasonable pricing for gorgeous results! Very happy customer! Edgewise did an awesome job!!!! They ran a beautiful boarder for my garden area and around my mail box!! I’m so glad we found them because now my pine needles won’t wash away. They cleaned up afterwards too, like they were never there! EdgeWise Curbing did an outstanding job framing our grassy areas with beautiful curbs! Martin and his staff were very professional, prompt and meticulous in their work. We highly recommend them! You won’t be sorry! Martin and his crew are prompt, professional and have an eye for detail. All things you expect in a job like this. They put concrete curbing nearly all around our property and we cannot wait to fill it in with plants and other landscaping. It’s beautiful! Edge Wise Curbing was efficient, perfectly priced, helpful, kind and on time. What a great choice I made choosing Edge Wise to enhance the look of my property. They put a lot of care in their work. I would definitely recommend them.